According to the Harvard Heart Letter, scientists have been exploring the connections between the mouth and the heart processes. Individuals who experience erosion of the gums and bone that support the teeth (periodontitis) can release bacteria into the bloodstream through chewing and brushing. Some types of periodontitis bacteria have been discovered in atherosclerotic plaque in arteries of the heart. This plaque is one of the things that can lead to a heart attack. The same oral bacteria might also harm blood vessels or cause blood clots by releasing toxins that resemble proteins found in artery walls. Our immune system’s response to these toxins can harm vessel walls and make our blood clot more easily. There is also some speculation that oral inflammation ignites inflammation throughout our bodies, including in the arteries, where it can lead to a heart attack or stroke. Brush your teeth at least twice a day (no surprises here). Replace your toothbrush every four months. This maintains the integrity of the brush and keeps harmful bacteria from hanging around. Watch for signs and symptoms of oral disease such as receding gums and visit your dentist if you notice any problems. There are also a few studies indicating that chewing sugar-free gum might contribute to overall dental health. Unfortunately, most of what I’ve uncovered was sponsored by the chewing gum companies and I hesitate to promote it. However, I did find one source that is worth passing along. It speaks of chewing miswak sticks and I’ve read similar information on licorice root and juniper for those who want a very natural oral hygiene. Looking over the research and thinking of my own family history, I have to side with most of it. My 93 year old grandmother sports a lovely smile while my other relatives who suffered heart issues, really didn’t or if they did, suffice it to say, they were “store bought”. I haven’t taken to chewing miswak sticks but I have placed floss in several places along my path so that I can’t avoid it and I keep an extra toothbrush at the office. Do you have any other natural remedies for promoting good oral health habits that will ultimately produce healthier hearts? I had a rough time with this post for some reason. I apologize if the page was not found or the comments were closed. I think both have been remedied. By synchronicity, I have a dental appt. today that I was unaware of when writing this. I’d also like to give kudos to Dentist J. Michael Allen, one of my inspirations for this post. Dr. Allen directs the Osceola County dental clinic in Florida that he helped form. Allen also volunteers in an Orlando homeless dental clinic. “Lack of money is the main culprit behind poor dental care”, Allen says. Also by synchronicity, my little dog (Westie) is having her teeth cleaned today. Unfortunately, hers wouldn’t have looked as lovely as the ones in the photo: She had to have two removed. I simply must do a better job with her brushing! It’s hard for me to go along with the chewing gum idea, but I have read that certain herbs support dental health, as does ingesting healthy bacteria in raw milk and kefir. So much to learn! Hope you have a good visit at the dentist. I love our dentist and his Dental Spa. Aah . . . Dental spa might have a better chance of getting me their more often. I believe staying well hydrated also promotes gum health. Good catch. Apparently the bacteria thrives in a dry environment so staying hydrated makes it less inviting. It’s also a reason not to drink alcohol excessively as our bodies have to use the hydration to process the alcohol rather than maintaining gum health. Thanks for this important information! I’ve had the hardest time finding a dentist I like since I’ve moved here (I’ve been through 4 of them in 5 years). I just got a referral for one that a friend has been going to for 15 years, and I’m looking forward to trying him out. Thanks for the reminder to schedule a checkup! Good luck. I hope you do like him. If you’ve been unfortunate enough to get cavities, please keep the fillings maintained and current. A hole in the tooth is a direct pipeline for the plaque and toxins from decay to the heart, via the bloodstream. As one person mentioned, probiotics help cut back on the colonies of bad bacteria by stocking the body with the lactobacillus strains (among others). Kefir and yogurt (not the super sugary stuff but a better grade like greek yogurt) as well as buttermilk, miso and tofu are good nutritional sources. Don’t discount probiotic capsules. You can get a good grade of those at a store like Sunflower Market, Whole Foods or Sprouts (if you have any of those where you live). If not, Google it. Good deals can be had online! I actually used to give probiotic straws to one of my kids and I’ve forgotten all about it. I wish my teeth were as white as that animals! Unfortunately, despite the fact that I brush, floss, visit the dentist twice a year, use mouthwash, my teeth are still weak. Stupid genes! I just keep doing all I can, though. So, that weakness probably makes you more vigilant than others (a blessing in disguise). I read this and cringe. Thank you though . . .it’s things I need to hear! I have no problem with brushing and flossing. . .but I haven’t had dental care in a very long time. eeekk! It’s a good idea to go at least annually Debbie. We spent a month in Ethiopia and found that chewsticks (called mefaka) were used widely–for sale on street corners of Addis, and in rural villages as well. they had a pleasant licorice-woody taste, and we liked them. I think studies have shown that the chewsticks have high anti-microbial properties. A month? That’s cool. I have some of those licorice sticks but didn’t know what they were. Very good tips. My dentist also told me to eat all sweets in one go- better for the teeth- not necessarily for your overall health… but for teeth it is better you eat all sugary stuff all at once and not little by little throughout the day…. Yeah. Good call. My dentist says that too. Just sit down and eat all the candy and get it over with. Sugary drinks are the big culprit. Hmmm. I haven’t heard that but I can buy it and it’s easy for me to do as I hate that “morning breath”. I’m in the throes of a rather lengthy relationship with my Dentist so we can retrain my jaw. Glory be! This is going to be fun! The good news – my teeth are in pretty good shape and my gums are great. Glad to hear that. Hope the jaw work goes well too Amy. It’s funny that this all came together for me because the TOP thing that I find attractive in a man is his SMILE. 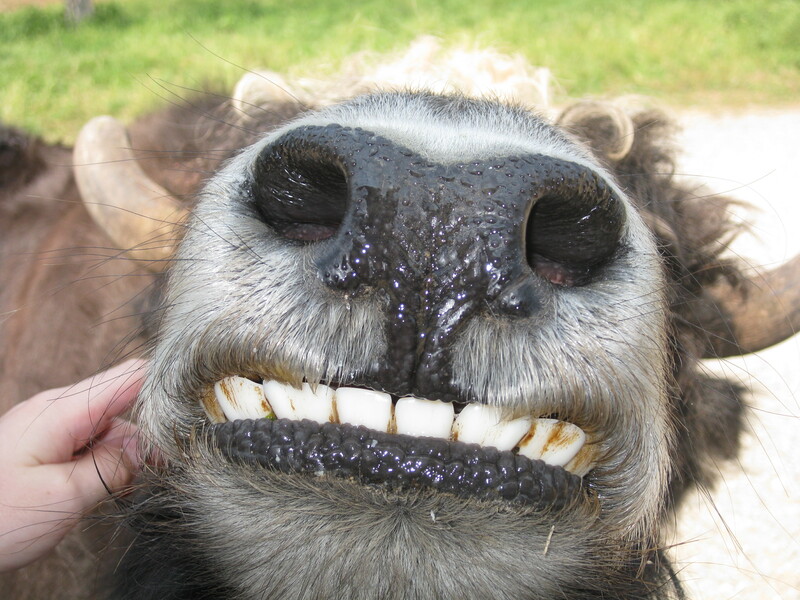 By the way, that toothy photo totally made me SMILE. I grind my teeth at night, which is not good, but I don’t have a single cavity so maybe I’m grinding them away – LOL. For anyone that has TMJ, google “Feldenkrais Exercises for the Jaw.” It worked for me! Tracy, I’m totally going to look into this and see what feldenkrais for the jaw is. I think I have this issue. Nice post Tammy! About 4 months ago I was diagnosed with early periodontal disease. If caught early, it’s very treatable. And it’s not always a sign of poor dental hygiene. Women can suffer from it more than men due to hormonal changes and stress also can be a factor. So if you do happen to get diagnosed with the disease, there are things you can do to counteract the effects like using a prescription mouthwash, a special toothbrush with super-fine bristles that sweep food particle from below the gum-line, cleaning every 3 months rather than 6, and of course regular dental hygiene practices. With early detection and a diligent course of action to counteract periodontal disease, one can probably keep their teeth well into their 90’s. Good to see you Lara. I have also had my battles with this early-stage, stress-induced disease. It can be managed but you can’t let up. Such a great reminder! I have tried to explain to my husband how important it is for him to take better care of his teeth. I’ve quit asking, and now just schedule his dentist appointments for him and tell him when and where he is supposed to go. Did you know that gum disease is also linked with premature births? The bacteria in our mouths might be one reason why some women go into early labor. I have always had gum problems even though I do everything on your list, and I had TWO early babies. Interesting. I think I did read that it could lead to premature births and pregnancy itself is one of the conditions that is hard on the mouth. I heard about that before from somewhere. Well, take it to heart so to speak. Hmm! that reminds me 10th of July is when I visit my dentist again! ( i really like her) Great post. As always. Good for you Rukmini. It’s good that you’ve found someone you like prowling around in your mouth. That always stuck with me. And I did floss more often. hmmm. That sounds vaguely familiar. And he probably said something about sunscreen too. Maybe fodder for another post? Thanks Kath. I assure you – it’s mutual. Yes, toothbrush maintenance is another great habit. I just have to add how awesome that picture is. Hilarious! Ps when it come to sustainable products and our teeth, I can personally recommend Preserve’s toothbrush recycle program (no don’t work for them or get paid/free stuff from them). I haven’t heard of it but will google it now. Tammy, do you know if there are herbs that we can grow in our gardens that are good for oral health? Maybe mint? Parsley? I like to grow herbs, but have never looked into the oral health connection. Basil, dill and peppermint are all said to be beneficial also. 🙂 Such a sweet and funny photo, and interesting subjects and comments. I agree with the dental floss, at last count I think we have 12 boxes of floss around our 2 bedroom apartment, ever since my husband was threatened with a deep clean he’s been a flossing fanatic, and now its regular. On my side, I’ve never had a cavity or problems, knock on wood, and I try not to take it for granted. I think the secret is to make dental hygiene as simple and easy as possible, and not something that people have to think about. You hit it on the head -make it as simple as possible. Maybe you can date one? I do not like flossing one bit. The thought of stuff flying from my mouth into my home makes me cringe. I might have to look into those miswak sticks! Great post! That’s a quirk that I haven’t heard of before. Dr. Allen, the inspiration for the post, believes that you can also do wonders with a regular old toothpick. Wow! I shared this with Ken because we’ve gone round and round about dental hygiene. I’m supposedly the extremist by brushing twice a day and trying to floss daily. Because he is so loved, I wanted him to understand the real science behind this, and you put it so well! I’ve heard that the electric brushes, while not a replacement for flossing, is a great addition to saving our gums. Either way, I’ll be getting my daily dose of flossing in today. Thanks again, Tammy!! Yes, Tiffany. Electric toothbrushes and water pics are both really helpful tools. I am rather lucky, just a yearly control/cleaning, my teeth are OK. My dentist always jokes about it and says “if all my clients´ teeth were like yours, I would be ruined !” I take care of them though, brushing twice a day, flossing, not much sugar. Thanks Tammy. Very interesting post. My dentist says the same and I sure hope that I can keep them like that. OMG, thanks for this interesting info, Tammy. I’m right with you on the flossing! I love that picture! I almost laughed out loud, it’s so cute. And I took it myself! It is hard and it’s got to become a lifestyle. Glad you found the blog useful.